The Courtyard by Marriott brand made its Cambodian debut with the opening of Courtyard by Marriott Siem Reap in January 2018. The 233-key property is a welcome addition to Siem Reap’s mounting business event offerings, boasting a range of activities and facilities for event planners seeking a chic and contemporary setting that pays testament to its Cambodian home, coupled with excellent service. I stayed in a deluxe room with a balcony overlooking the resort’s large swimming pool. Upgraded options include the executive room, and courtyard and presidential suites. The room was spacious and light, furnished with a corner work space with a desk and chair, and a 43-inch flatscreen TV. It is clear that Courtyard by Marriott Siem Reap has heavily invested in its business events facilities, presenting more than 850m2 of meeting space spread across seven function rooms. 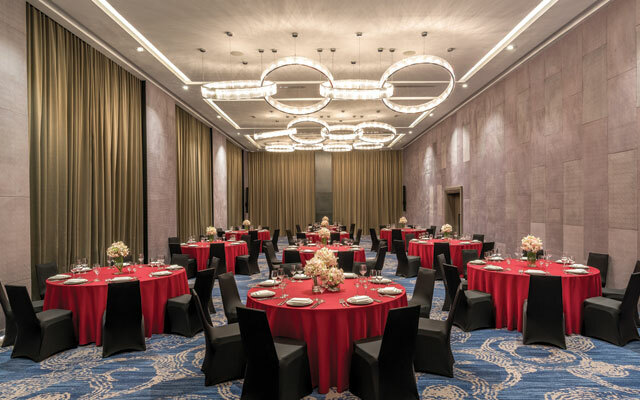 Its 410m2 ballroom – said to be Siem Reap’s only ballroom with natural light, thanks to floor-to-ceiling windows – has a five-metre high ceiling complete with stunning crystal chandeliers. It is equipped with state-of-the-art audiovisual equipment and flatscreen TVs. Planners will appreciate that use of the hotel’s event spaces comes with support from a full in-house events team. An additional five function rooms – or Think Spaces – can accommodate up to 460 guests. Boasting modern designs, the flexible spaces can be adapted to planners’ requirements. The resort’s Upper Deck rooftop bar also provides a great spot for private events, affording panoramic views that take in iconic Angkor Wat. A range of F&B outlets run throughout the property, with Lok Lak being the main restaurant. A spa and fitness centre are onsite. Trips, tours and activities, including an in-house cookery class, can be organised by the resort’s team.